Shrine is the new album from Hristo Gospodinov and, according to the press notes is intended as "a complex audio metaphor that can be interpreted as an aural equivalent of a "low level" lucid dreamstate". This means an almost complex dark ambient based on soundscape chosen mostly for their evocative quality. "The Grand Design" opens this release with some field recordings juxtaposed to a quiet soundscape floating between the two audio channel cradling the listener. "Immersion" relies in a darker and menacing drone while "Lost Beauty" is a soundscape based upon relatively high frequency noises coloring an, almost apparently, quiet field recording. "Somnia", the longest track of this release, is reminiscent of the audio spectrum and noises heard on a boat or on a beach. "The Iron Water" is a quiet soundscape while "Dream Captured In Stone", the shortest track of the album, seems a glitch experiment based on the samples collected for the other tracks. "Ruins" set a noisy environment until "On The Edge Of The Void" close the album returning to the atmospheres already seen in other tracks. As the cover suggests (oddly enough is a truly visual expression of the musical content) this album relies on almost oceanic field recordings that set the mood for an OST of some movie based of aquatic fauna or a documentary. For fans of evocative sound this release is a recommended one. Springs from old mattresses, dented cowbells and trychels, corrugated metal sheets, old-fashioned boxes for candies, tea bags and truffles, rusty harpoons, zappers, a wide assortment of gimcracks and electronic toys combined to roughly effected guitar ennoble the funny equipment of this bizarre release by Tyrolean (but Luxembourg-based) drummer, percussionist, performer and composer (a list of emeritus qualifications taken from her website) Elisabeth Flunger and Luxembourgian "electrician" Tomas Tello, who named their eccentric project E.T. (supposedly from their initials). Their "Labor" shows neither an obsessively epic nor an academic approach, it could be rather qualified as recreational: weird echoes and sounds on metallic hits of the first track "Miracle Merchants", the electric brushes and bleeps on sci-fi/lo-fi sounds which sounds coming from rudimentary theremins created with radio antenna on "Closer To The Sky", the acute electric peeps on percussive sizzles and grumbling of sonic waves on "Tar and Feather" are going to catch listeners' attention and persuade them to keep on listening their funny fumbling with objects and electrons, which sounds engaging even when their weird collages becomes more brooding and nervous ("Otra Tormenta"), frightening ("Se Fue'", "Imminente") or abstract ("Katze Was Tust Du?"). Their nice and eccentric tracks will implicitly strike a blow for all those people and loyal supporter of recycling who prefer to spare any kind of odds and ends and rattletrap insted of throwing them away while foreseeing a certain undefined utility related to their preservation! Have you thought about the possible existence of an authentic orchestra inside a rubbish bag? E.T. are aware about it! Have a listen! It frequently happens that composers of soundtracks or any other cultural product whose format they have to adapt to have to acquiesce in some "limitations" or bearings of their creative skills. This is not the case of talented Austrian musician Christian Fennesz as it seems that his aesthetics manages to receive "anointment" by a prolific artistic fellowship with Austrian director Edgar Honetschaeger for his movie "AUN - the beginning and the end of all things", whose meaningful plot based on a symbolic story where reflections on mankind's quest for the future and desire to forge it, focusing on the dichotomy between man and nature while offering a less sensual vision of mankind's future whose challenges cannot be faced just with economic or scientific tools by walking on philosophical paths of Japanese Shintoism and anthropological essays by Claude Levi-Strauss, looks complementary to the cues offered and the breeze of thoughts inspired by the listening of Fennesz's music. Listeners who already know Fennesz's past releases willeasily notice the ontogenetic transformation of his style as AUN sounds almost totally free from glitch constituent, in spite of the fact he's considered one of the most important pioneer of that branch; he minimizes that constituent with traces of electronic buzzes and discharges, sweetened pebbles or bubbles within bubbles which are wisely thrown or injected through pinpricks of needles threaded in his amniotic fluids (a process which is quite clear in tracks like "Mori" or "Shinu") whereas his reasearch reaches the highest peaks when it sounds focused on the balance and amalgamation between acoustic inserts and placid melodies, resulting in genuine sonic pearls such as the two main themes - "Aun40", whose dilutions look like gradually staining, and "Aun80" with hooking guitar splashes -, the delicate guitar-tinged melody of "Nympha", the softened ascension of "Sasazuka" as well as the three (already issued on the collaborative release "Cendre" in 2007) tracks - the obscure cogitation of "Aware", the daydreaming "Haru" and the pensive catharsis of "Trace" - where Ryuichi Sakamoto drips his piano. I can say Aun is another masterstroke by a musician which got accustomed to nimble brilliant musical motions. I think that the first time I listened to Viridanse was thanks to the fanzine Amen and to the split tapes they were selling with their issues. Viridanse were on one of their tapes along with The Art Of Waiting (band coming from Bari that did only a MLP and that I hope someone will reissue soon). Viridanse were coming from Alessandria, Italy and they were active from 1983 to 1987. They did only two releases, both for Contempo: a MLP titled "Benvenuto Cellini" and an LP "Mediterranea". 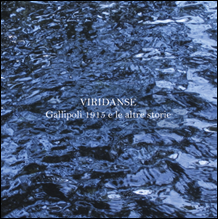 This double CD compilation "Gallipoli 1915 E Le Altre Storie", gathers both of them plus seven songs recorded live in Alessandria in July 1984 (unfortunately it wasn't possible to get a decent copy of the Amen tape to use) and a selection of four songs coming from the "Psycho Session" recorded in 1987. The first CD is the one that will please new wave and post punk lovers as on tracks like "Benvenuto Cellini" or "Vaso Cinese", the band was giving form to a personal mix made of razor blade guitars, punching bass lines and tribal drums. Another cool track is "Ultimo Canto": on this one, they used an atmospheric piano intro just to start a great energetic post punk song with drum, bass and guitars building a wall of sound. Lyrically the songs of this EP talk about freedom of expression (the title track), freedom of choice ("Ultimo Canto"), frailty of human relationships ("Vaso Cinese") and the fear of diversity/prejudice/marginalization ("Justine"). The seven live tracks are a historical document of their first years and are sounding like the ones of "Benvenuto Cellini", as they have been composed on the same period. The recording isn't perfect as the vocals are a bit low, but they testimony the energy and the impact Viridanse had on live gigs. "Dolce Vita", for example" recalled me band like A Certain Ratio and "Gallipoli 1915" is so aggressive that on some parts it seems a punk song. For "Mediterranea", the band changed slightly their approach to songwriting. The vocals are now more melodic and sustained at the end of the words (if you know early Litfiba, you know what I'm talking about), the rhythms are always upbeat and rich, also the bass lines are more sophisticated (Flavio Gemma was playing a second melodic line which enriched a lot the final result) and help sustaining the rhythm line very well. The overall atmosphere is less tense and here and there you can hear middle-eastern melodies. Recorded in Torino and produced by Marziano Fontana, "Mediterranea" is the natural consequence of a process of a band that wanted to grow, detaching themselves from the post punk spontaneity, creating a music that was also a challenge as songwriters. On this album they focused their lyrics on freedom like on "Sulla Strada", "Terra Di Sempre" (this one talked about the Palestinian people and about the feeling to being part of a stolen land), "Frontiere" and "Notte Chiara" or generally on a feeling of peace that could be felt on particular places or situations (like the sun warmth and the breeze of "Mediterranea"). The four closing tracks "Morgana", "Guarda La Balena", "Fronte Del Porto" and "Al Centro Del Mondo" were part of a recording session for an unreleased album. On these ones Viridanse recalled me the latter Denovo or Diaframma: the tracks were more influenced by Italian 70s music rather than post punk and I think that Antonello De Bellis, Enrico Ferraris, Flavio Gemma and Paolo Boveri could have joined the I.R.A. label hands down, with this kind of sound, but this never happened and you can only enjoy these tracks on this nice double compilation. Most of Cold Spring releases stands out not only for the remarkable sound quality but also for the mysterious allure of concept and this record signed under commission of Cold Spring itself by Scottish sonic craftsman Kevin Doherty, who named his dark ambient project "Sleep Research Facility" to underline his personal research about sleep-conductive beatless music, is no less fascinating both for the concept, based on one of the most mysterious military secret, the so-called Stealth (the development of its technology, which makes it invisible to radars and other detection devices, is so mysterious that someone argues its invention could be related to the finding of some alien starship), and for the sonic result, whose source (available for free on a bonus cd for people who will manage to buy one of 1000 copies of its first edition) comes from intercepted field recordings inside the hangar environs of a US Air Force base in Cambridgeshire (England) during the maintenance of a Northrop-Grumman B-2 Stealth Bomber provided by Si_COMM. Kevin emphasizes the mysterious aura of such a place all over the long-lasting five untitled tracks with a bunch of ultra-low frequencies (the ones in the first track are so low that they could shake windows and objects of your room), clouds of spooky drones (the ones in the third and fourth track sound particularly magnetic), electronic chirps, disquieting echoes, muffled roars, sonic sediments, radio signals and distant hisses, which sometimes are close to the threshold of perception. The nebulous and somehow uncanny atmosphere Kevin creates could be associated by some listeners to sonic repertory by Andrew Lagowski or Robin Rimbaud (Scanner). In order to appreciate even the most imperceptible variations and details of this record, the artist itself recommends the usage of good headphones.